We will run the same prog ram June 10th-14th & June 17th-21st from 9am-12:30pm. 5 year olds entering Kindergarten through entering 6th grade can participate in the program. The pricing is $50 for the first child and $45 for each additional sibling. Payment can either be made by cash, check or credit card in the office or calling the office at 813-968-1077. Children must attend 1st grade faith formation classes to make First Reconciliation and First Holy Communion in 2nd grade. Children in Catholic School register for first communion preparation sessions at the parish to make their First Reconciliation and First Holy Communion in 2nd grade. Parents: Explore this link to find resources you can use with your children. Enjoy! A team of dedicated catechists work with the children of the parish helping them grow in their understanding of their own faith in God and knowledge of the Church. 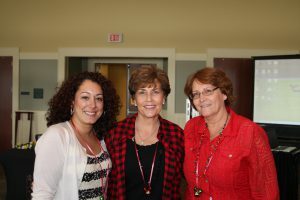 This journey is accomplished by using resources approved by the United States Council of Catholic Bishops and following the curriculum set forth by the Diocese of St. Petersburg for each grade. The children learn about their faith and prepare for sacraments with age-appropriate texts and activities. 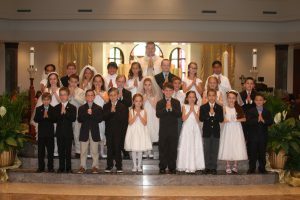 Children who have attended first grade faith formation at the parish or Catholic School will prepare for First Reconciliation and First Holy Communion the following year. 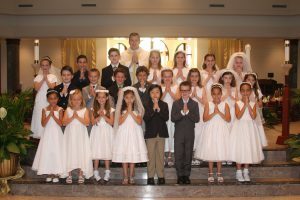 Please see the First Communion page under the Sacraments tab for more information, click here. Second year – prepare for the Sacraments of Initiation: Profession of Faith, Confirmation and First Holy Communion. Second year, they will attend RCIA (Rite of Christian Initiation for Adults) Adapted for Children sessions. These sessions will prepare them for the Sacraments of Initiation: Baptism, Confirmation, and First Holy Communion. If your middle school or high school youth was baptized Catholic, but never received First Communion, call the faith formation office at 813-961-1716. Please contact Peggy Cloutier at 813-961-1716 or peggy.cloutier@sainttims.org for more information.